USA-based Larson Electronics, an industrial LED lights leader, has announced the release of a new pedestal mount LED work lamp that can light up to 4,000 square feet of work space featuring a convenient pedestal mount base stand and 100 feet of chemical-proof SOOW cord. This latest and safe LED light is Class 1 Division 1 & 2 and Class 2 Division 1 & 2 rated. This portable LED work light is mounted within an A-frame portable stand made from thick aluminum and powder coated for super durability and harsh environments reliability. This LED work light produces a wide flood lighting pattern that is suitable for lighting enclosed areas and hazardous locations where flammable vapors, gases and dusts may be present. This industrally safe LED work lamp is made up of a seven-inch-wide square light head installed within a pedestal base stand with an easy-to-carry handle. The LED light assembly includes four 12.5 watt LED emitting diodes producing a total of 4,333 lumens . The diecast aluminum body and LED work light provides excellent durability and vibration resistance. The lamp can be easily turned up or down 90 degrees and locked into position by simply unfastening the two hand screws located on either side of the light head and tightening them once the desired beam angle is found. 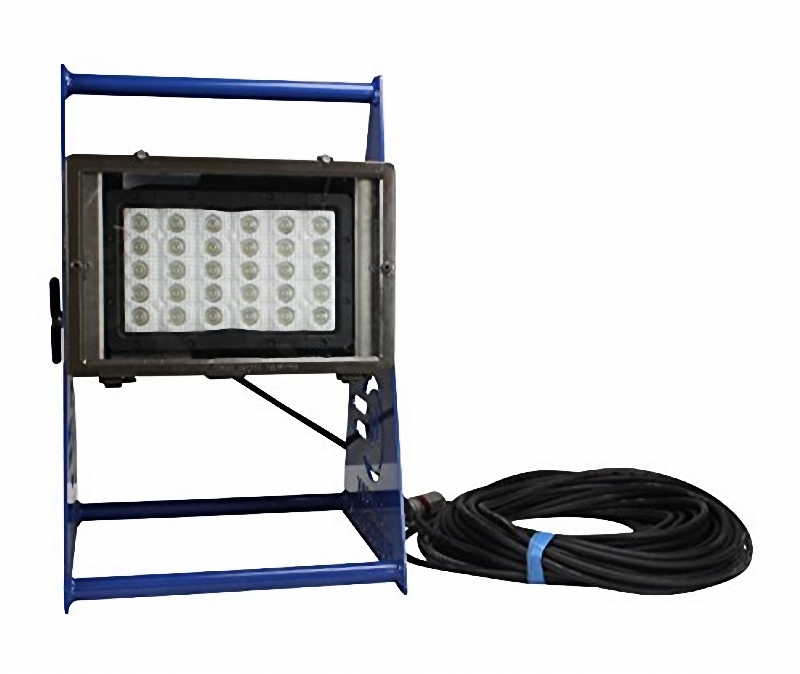 This IP68 LED work light is made with 100 feet of 16/3 chemical and abrasion resistant cord that is fastened to an explosion proof cord cap for easy connection to explosion proof outlets. Some successful projects have proven this LED work light produces a powerful punch in a compact form, providing operators with an excellent solution for small work areas. While maintaining the light output of a metal halide, this LED work light will not produce as much heat and also uses less power to operate.